It might not sound like fun to be surrounded by 10 – 15 Black Tip Reef Sharks, but until you’ve done it, you won’t understand the thrill and the excitement that scuba diving at Phi Phi’s Palong Wall can bring. Some of the dive sites there are absolute mecca’s for Black Tips, and another one of our favourite dive sites, ‘Turtle Rock‘ is a home for hungry Hawksbills, many of them very unperturbed by divers so they make for great muses for photographers and videographers. Phi Phi also plays host to schooling Big Eye Snappers, Golden Trevally, Harlequin Shrimp and some Nudibranch life like the Stricklandi & Halgerda families. 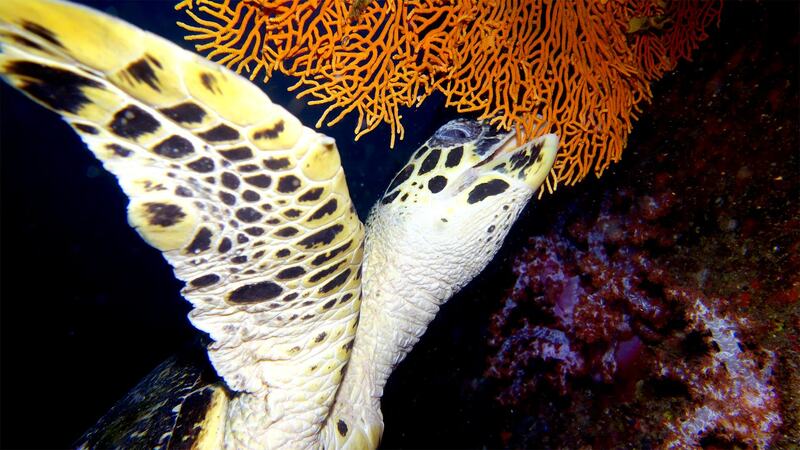 It truly is a wonderful diving experience for all levels of certified divers! On the return journey from Phi Phi to Phuket, we stop at either Shark Point or Anemone Reef, both sites are famous for Tiger Tail Seahorse and have regular Leopard Shark appearances. Both sites also attract Whale Sharks, this season we have had many amazing experiences with these gentle giants on both pinnacles. If you are a Macro fan, Anemone Reef is an explorers paradise as the fine sand surrounding it attracts the rare and exotic, the pinnacle itself is alive with Anemones and a busy home for Tiger Tail Seahorses! ^ If you need to rent scuba equipment there will be an additional charge 500 THB for a full set. 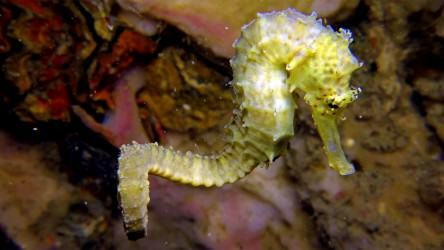 The Phi Phi Island diving day trip tour is suitable for all certified divers as well as non divers and snorkelers, it is not recommended for Discover Scuba Divers. If you have your own equipment, great, bring it with you on the day trip when you are picked up by our local drivers in the morning. We have both DIN and Yoke tanks on both vessels, and adapters for DIN to Yoke. Your equipment will be safely brought to the boat by our crew, no worries on your part, just relax and talk to your guide. If you require scuba diving equipment, either a full set or partial, please see our Equipment Rental page for a full list of available equipment and pricing. We also have a lot of spare equipment on board, wet suits, fins, masks, regulators and BCD's, ensuring that a malfunctioning piece of equipment won't ruin your day! Our dive tours to Phi Phi Island & Shark Point, usually see us doing the first two dives at Phi Phi, with the final dive of the day at Shark Point or Anemone Reef. 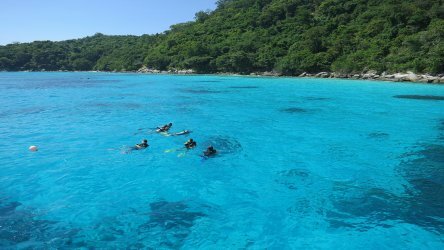 Organising the dives this way is extremely good for courses, new or returning divers as it allows you to get back in the water on shallow, easy dive sites around Phi Phi, then onto Shark Point and Anemone Reef which can be a little bit more demanding. Not had enough? 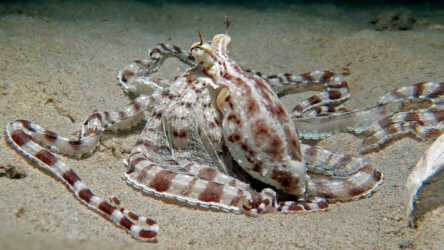 Then visit our more indepth Phuket diving site section to get a real feel of what you might see. Combine with our other tours for a great 3 day package. 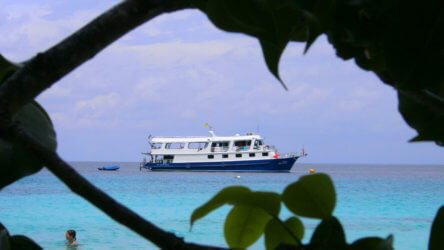 Contact us directly for discounts and deals on multiple days of diving with us. You won't be disappointed. We know how tough it can be to make a living as a diving professional so any dive pro who books with us gets a 15% discount on all of our day trips. Don’t hesitate, Phi Phi Island diving is not to be missed, incredible reef, shark & macro diving, plus Phi Phi Island is one of the most majestic series of limestone cliffs and hidden beaches you might see in Phuket or Thailand, so what are you waiting for, book your scuba diving day trip tour to Phi Phi Island & Shark Point with Local Dive Thailand today, and be diving tomorrow! 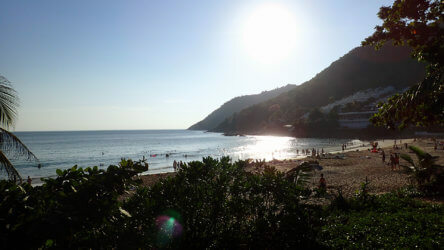 Why Phuket For Your Scuba Diving Holiday?